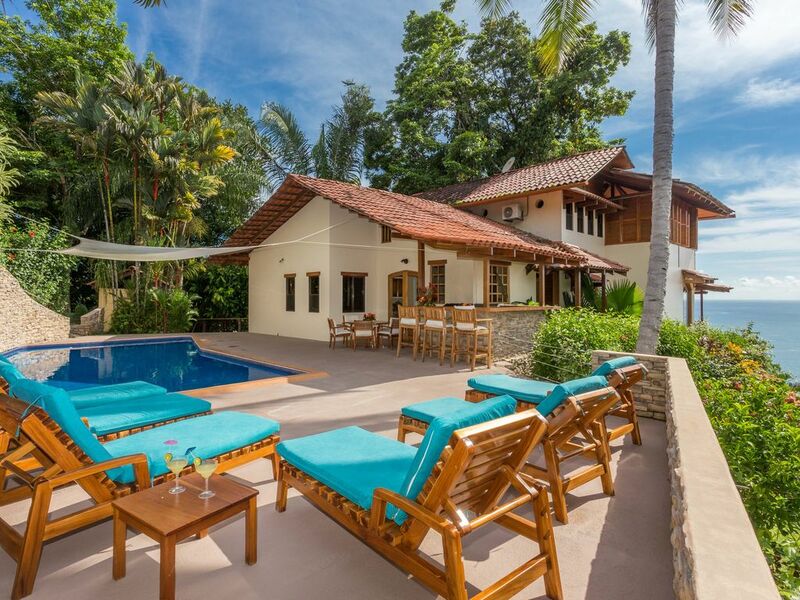 Welcome to our Manuel Antonio home, a fully-staffed, 6-bedroom, 6-bath luxury Villa and Guest House in an unusually private and beautiful setting bordering the 50-meter Maritime Protection Zone. The Villa and Guest House are perched high above the Pacific, with ever present sea breezes and sounds of surf crashing below. Our beach (Playa la Macha), which is usually deserted, is a 15-minute hike from the Villa. Ours is the only residence in Manuel Antonio with a cove all to itself and one of the few close enough to the water to hear the surf crashing against the rocks. The house is of the finest construction in teak, cedar, almond, and terra cotta, all sited in beautiful landscaped grounds. Each bedroom has a view, a king bed and it's own bathroom. Two of the bedrooms have their own living areas, in addition to the bright and breezy main living space. Villa La Macha is located in one of Costa Rica's most beautiful coastal areas, Quepos and Manuel Antonio. An almost endless string of secluded coves and tropical beaches and the charming, well-supplied town of Quepos are minutes away. Five miles down the road is a jewel of this ecologically sensitive country, Manuel Antonio National Park. The waters offshore offer some of the best marlin and sailfish sport fishing in the world. Villa La Macha is handsomely furnished in teak furniture and original artworks and provides a beautiful home for families, small wedding parties, and groups of friends to share. Please see the YouTube video titled Villa la macha path to beach. Views of the mountains from several parts of the house. And we are right in the rain forest. Located on a cliff directly over the Pacific Ocean. No house in Manuel Antonio is closer. High thread-count sheets. Bath and beach towels provided. Covered, open-air jacuzzi with stunning jungle and ocean views. Extraordinary ocean and jungle views, so close you can hear the waves crashing below. Fully Staffed - we do laundry, cooking, and all cleaning. We also will arrange any tours for you.